Facebook have announced that they will be changing their custom audience and conversion tracking pixel over to a new pixel that encapsulates both. In this video, we will look at how you can install this with Google Tag Manager to track Conversion and build retargeting audiences. The Pixel is fired on every page, but Facebook decides what should be done with the data. Since I didn’t enter the site via Fb the hit is most likely not going to count against the conversion goal. It might be used as Audience pixel. Great video Julian. I did notice though you are masking the Facebook Pixel ID in the script but not in the noscript. Might be worth adding that in as well. And the zip file is not attached to the link. Ha, thanks for the heads up. Yea, I should have blurred this. Hey Julian, I think this is a great video on the new FB pixel. If I wanted to track two different campaigns for two different products would I need to place two different tags with different triggers for those campaigns or just one tag with more triggers? By the way, love the new measure school interface. thanks for your question Nathan. Only if you have different IDs for your pixel you would need to replicate the tags and triggers. But you could also have two campaigns in Fb running and only one Pixel on your page. Fb will keep track through which campaign the user came and attribute it to the right campaign in their interface. Great! Thanks for the clarification on this. I’m sure we will be using this in the near future. no, you could build a new Trigger that fires on custom Event ‘formSubmitSuccess’ and attach that to your Fb Tag. I have watched your amazing video on new facebook pixel. You recommend to fire facebook conversion tag inside pageview tag. In that case we fire 2 pageview Facebook tags. I am just wondering if it might double data in reports. thanks for you question. Yes, you are right. The ‘pageview’ action would be fired twice. But since Fb is not a Web Analytics software (such as Google Analytics) the second double tracking would not skew our data. We are using Fb to build a custom Audience (Retargeting) and the double tracking would have no impact on the User being retargeted. I hope that makes sense. The ‘purchase’ event is fired only once, so that is not double tracking. Got it. That`s great! Thank you very much. I find it cleaner if you setup the facebook pixel code core and page view as its own Tag. Then create the fbq tags as seperate tags based on different triggers and so on. To have them load after the Core tag use the Tag Sequencing to fire these AFTER the core tag has fired. no, you can only send in custom data through custom dimensions/metrics (these need to be strings) and they need to be scoped to a hit type. GA actually prohibits you to send in any email or PII into the tool because of privacy reasons. There is a typo in the URL to your facebookpixel template page in the description section and the download links don’t work on that page. It has been a while, but thanks still! Great document!! Signed up for Email course but some of the videos won’t click through. Quick question- on the FB Guide it says to Have the Base Pixel fire After any FBQ tags. However below you state FBQ should be fired after. What do you think is the best practice? I fixed the email course. Should be working again. Could you point me to the FB Guide that says to fire the base Pixel after? From my understand the Base Pixel is the library. Any further function calls depend on the library being loaded. That’s why I couldn’t imagine why the base pixel would be loaded after. Thanks Julian. Here is a screenshot from the FB Instructions out of Ad Manager. It looks like they want you to fire the base after unless I’m reading it wrong…? yes, you are reading it wrong. 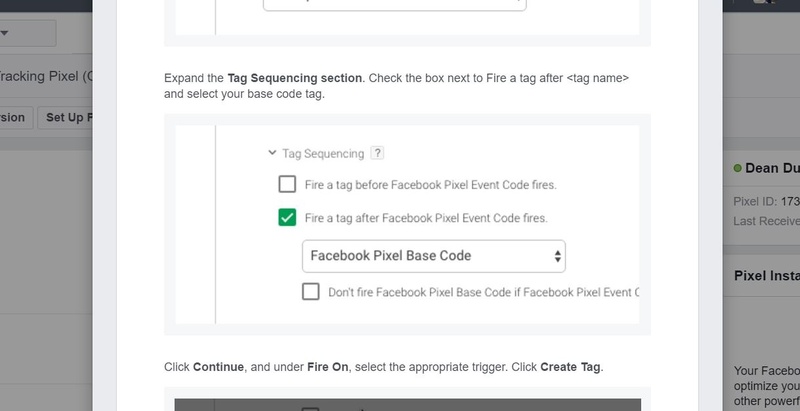 this shows that the tag (the fbq tag), should fire after the Facebook Pixel Base code. sorry, I can’t support you on this because it would entail custom coding, which takes too much time. Yes, you are right. I guess you can rewrite the script, but I can’t do it off the tip of my fingers. If you figure it out, please post the answer here as it might help others.